Who's screwing around at my desk during my absence?? That cabinet wasn't there when I left! Notice my Singapore Airlines Boeing 747-400 plane on my monitor. My buddy, Mark sent this pic to me via his phone. 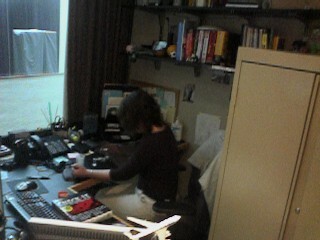 Anyways, that's my co-worker, Lisa looking for spare screws which I keep for laptops, etc. Glad they came in handy.